I have always dreamt of visiting ‘Mother Russia’ — after all, as the world’s largest country, it offers a vast variety of vibrant cultures, lavish monuments and lush sceneries that can leave just about anyone in utter awe. Truth be told… I wanted to make my first trip as a Trans-Siberian Railway tour; however, I was terribly pressed with time so I’ve decided to do the next best thing: go on an amazing river cruise from St. Petersburg to Moscow! Now of course, as a third world passport holder, I know that I had to apply for a tourist visa beforehand and as you might expect, that was the only thing that didn’t thrill me at all about my trip. Thankfully though, applying for a Russian Visa at the Embassy of Russia in Manila, Philippines turned out to be an easy and fast process — albeit a tad costly. So hopefully, with the help of my Russia visa guide below, your experience would else end up as hassle-free! NO ONE can give you a guarantee on your Russian visa’s approval — not even a lawyer, a consultant, a travel agent, or an embassy employee. Anyone who says otherwise is most likely going to be a scammer. 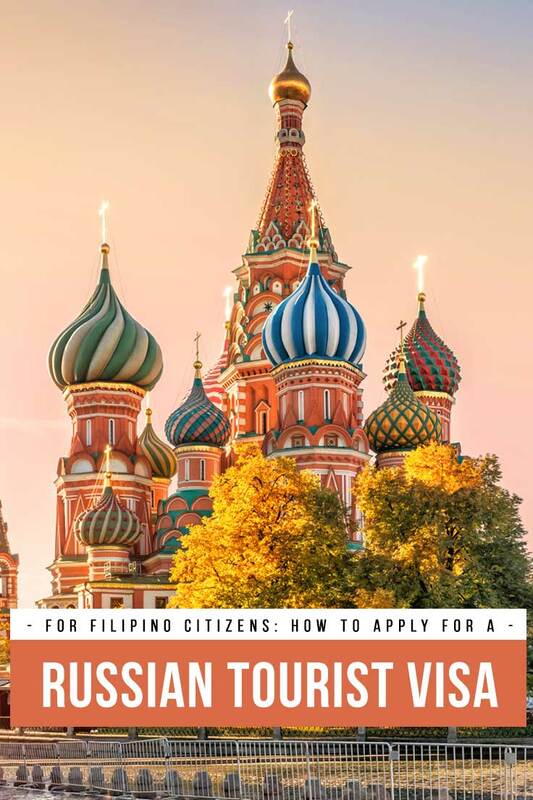 That being said, what I can offer you here is a comprehensive guide with helpful tips to increase your chances of getting that Russian tourist visa. Top photo of Red Square from Shutterstock.com. There are, of course, various types of Russian Visas out there that you can apply for: a visa for business, a visa for transit, a visa for studying, a visa for marriage, etc. For this particular guide, I will only be discussing the requirements for a tourist visa since it’s an experience that I’ve gone through myself. If, however, you have a different situation or purpose of visit, it’s best that you contact the Embassy of Russia in the Philippines for more information. Below are the documents that will be asked by the Embassy of Russia when you request for a tourist visa, and I gotta say… it is the shortest list of requirements that I have ever seen in all of the visa applications that I have done so far! Under “Country” select ‘Philippines’ from the dropdown menu. Under “Hints and help language” select ‘English’ from the dropdown menu. Select ‘Complete new application form‘. The following pages will be self-explanatory. Fill in the information as accurately as possible and then print it on A4 paper. Write down the number of your Russian Visa application form’s number which is found at the top-right hand corner of the page. You will need this number in case your session times out or if you need to come back again to fill out some of the other details in the form (after all, you can save a draft of your application by clicking “Save Draft” and then accessing it at a later time. Just remember that if you make a pause of more than 20 minutes, your session will time out and you might have to start the process from the beginning — so make sure to regularly save your form. Meanwhile, your application form will only be stored for 30 days from the moment you have first saved it). There will be a section in the application form that asks for details about your “Travel Voucher/Confirmation” (to be discussed in the below section of this post). Please make sure that the dates on the application form is the same with the dates mentioned on your Travel Voucher. Once you’re done printing the form, you need to glue/paste a passport-sized photo (size 3.5cm x 4.5cm) on its designated space on the application form. Remember that this photo must be taken no longer than 6 months prior to the application submission, and that you must have a neutral expression on. Don’t forget to write the date and put your signature on the form. Passport – Make sure as well that your passport is valid for 6 months beyond your intended travel date or as indicated on your Travel Voucher, it has your signature, and has at least two (2) blank pages. Travel Voucher – The thing about traveling to Russia is that you need to be “invited” by an ‘authorized person’ accredited by the Russian Ministry of Foreign Affairs. BUT don’t worry because though it sounds intimidating, it’s quite an easy document to acquire because you can ask this from either your hotel or an approved travel agency (other times, you can just simply order it from websites like RealRussia). Naturally, before ordering a Travel Voucher online, first ask with your hotel or your travel agency since they can provide it for FREE. For my case, I got it for free from my cruise tour provider. NOTE: There are a LOT of terms used to refer to a ‘Travel Voucher’, such as ‘Russian visa support’, ‘Russian tourist voucher’, ‘Russian tourist invitation’, ‘Russian tourist confirmation’, etc. Do NOT be confused by these names because these all relate to the same document, and for the sake of consistency in this post, I’ll use the term ‘Travel Voucher’. – You don’t necessarily need the original Travel Voucher because a faxed, scanned or emailed copy is fine. – A mere hotel booking is NOT a Travel Voucher nor will it ever be a substitute for such. So always make sure that what they will issue you is a Travel Voucher or that they are registered with the Russian Ministry of Foreign Affairs. Confirmed Return Travel Tickets – It is important that the dates on your flight ticket are the same as that on your Russian Visa application form and Travel Voucher. Now… unlike most embassies, the Russian Embassy’s requirement for airline tickets is different: if the rest only asks for airline reservations, Russia rather asks for confirmed tickets. This is indeed rather risky, but unfortunately, it’s their requirement — I guess, in a way, knowing that you’ve booked this guarantees them that you have enough financial capacity (after all, they don’t ask for any documents supporting your financial capacity). NOTE: There have been conflicting info about this online. The Embassy of Russia says that they need confirmed tickets, but there have been instances wherein applicants were approved even with just reserved tickets (but a majority, like me, were asked for confirmed/booked tickets). Personally, I think you should submit confirmed tickets like what the embassy requires because chances are, they will ask it from you when you apply, and if you don’t have it, you’ll have to come back again. NOTE: It is possible that the Russian Embassy may request for more information or additional documents from you which is apart from the basic requirements above. For my case though, they didn’t ask for anything else (thankfully!). NOTE: Be reminded that this visa fee payment is non-refundable and it does NOT guarantee the approval of your Russian Visa. You can also appoint an authorized representative or travel agent to lodge your Russian Visa application and claim your passport and visa results. Regular processing, as I’ve mentioned previously takes 2 weeks (and rush processing will take 7 days and it is very pricey!). I went for the regular processing, so after I filed my application on March 7, I got my Russian Visa on March 21. …and well, that’s it! Just don’t forget to bring your claim stub/document. Activities to do around Russia? ◘◘ How long is the Russian Visa valid for? Russian tourist visas usually do NOT exceed 30 days and your Russian Visa will only be valid within the entry and exit dates mentioned on your issued visa. After all, the reason why they ask you for the exact dates of your exit and entry is because they don’t give allowances on the dates — it will all be exact. Take note as well that these visas are non-extendable and non-convertible. ◘◘ When is the earliest time that I can apply for a Russian Visa? It is advisable to apply at least 2 months before your intended travel date. I wasn’t interviewed, but of course, depending on your situation, it might be possible that they will request to do an interview with you. ◘◘ Do I need to submit hotel reservations or my bank statements too? The Russian Embassy does NOT require these documents to be submitted. You can bring them along during your application just in case they need them, but it’s highly unlikely that they’ll ask these because for example, your Travel Voucher will already mention where your accommodation will be and your confirmed flight tickets can already somehow prove your financial capacity. ◘◘ I saw that I can apply four a double entry visa, can I apply for a multiple entry Russian Visa too? Unfortunately, no. Only US citizens are currently eligible to apply for a multiple entry Russian visa. ◘◘ I don’t understand the contents of my Russian visa. What if there’s an error on it? 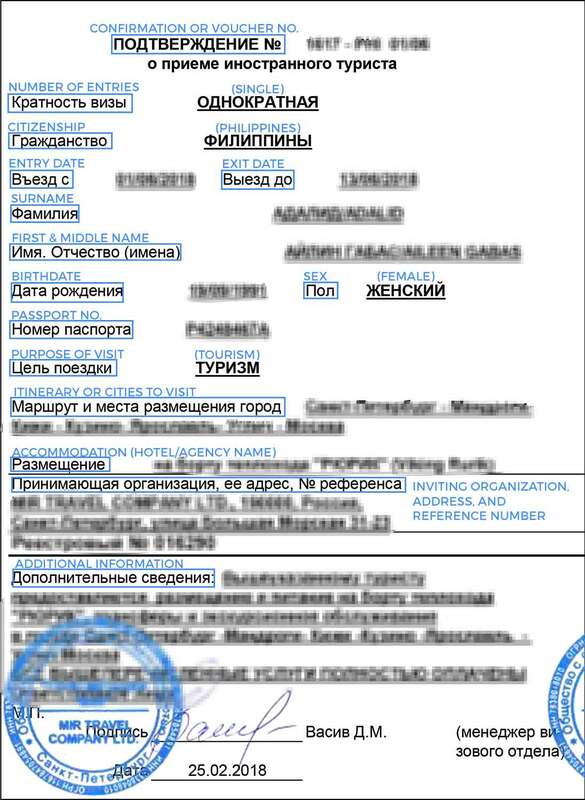 Once you received your Russian visa, there is a document near the exit that shows a translated version so that you can better understand what’s written on it. Meanwhile, in case of any error on the details, just notify the visa staff. As you can see, applying for a Russian visa is easy, and I hope that with this visa guide, I can help you prepare better so that it will all become a swift success. Do you have any other info or tips to add? If you’ve already applied for a Russian Visa before, how was your experience? Thanks for the post. I got a lot tips from it. btw as soon as you landed Hong Kong did you fly straight to St. Petersburg afterwards? My scheduled flight from HKG to Moscow is at 1135 and I plan to take the AM flight and will arrive at Hong Kong at 0810 is the arrival far from departure in Hong Kong airport? I think my flight before had a 2-hour time interval between the connections :) The airport of Hong Kong is huge so you can wander around or just lounge. Hi, we are planning to go to Russia. You’re is very helpful. I would like to ask where did you get your travel voucher? We are from the Philippines. Can we just book a hotel and ask for a travel voucher from them, and not book any tours? We would like to walk on our own and discover Moscow/St. Petersburg. Thank you and hoping to hear from you soon!! Hello, Ms. Aileen! Can I ask which airline did you choose in flying from HK to Russia? And what airport in Russia did you arrived in? Thanks for the information here. It's very helpful. I'm actually in the process of submitting an application. 1) On the online form of the Russian Consulate -- there's a page that asks: "Which institution you are going to visit?" and a confirmation number. Is this the part where you fill out details of the Travel Visa Support? 2) I was trying to fill out the form on your recommended site, RealRussia. Philippines is not part of the form where you select your citizenship. How did you go about it? Looking forward to your reply! Thanks and more power! 1. Yes, those woudl be the details on your travel visa support or travel voucher. 2. I see, they used to have Philippines. Anyhow, I got mine from the cruise company that I toured with. If you already booked your hotel, you can also request a travel visa support from them. Thanks for this info coz it gives me idea on how should I get my visa and hopefully I'll get approve coz my boyfriend's family want me to be in there in his mom birthday. This is such a useful post, all information in one place! thanks a lot! Hi was your visa approved?